The call for eyephoneography #3 is now closed! In only one month, we received 378 submissions for a total of 1890 photos. For those who like measuring things with numbers, this represents a huge success considering that i.Phoneography (the show organized in 2010 by one of the eyephoneography #2 and #3 committee members, Attilio Lauria) was the world’s largest open gallery call and competition for mobile photography to date with 651 submissions and roughly 2600 photos received in a period of two months. Besides exceeding those numbers when taking into account the shorter duration of our call, eyephoneography #3 becomes also the most selective open call for mobile photographers, by far, with only 1% of participants that make it to the exhibit. We would like to thank all the people who have sent their submissions: we know that it was not an “easy” call and we appreciate the effort you made to send something meaningful. Many submissions are really stunning, and each member of the committee will surely have a hard time selecting his/her favorites. We also wanted to thank those who have shared the open call on social networks and the numerous blogs (ClubCultura, Lenscratch, EyeEm, iPhoneArt, Fotogriphone, Cienojos, just to name a few) that have promoted it. It was extremely nice to see how often this open-call was referred to as serious, focused, solidly planned, professional, important and prestigious. A special thanks goes to Marty Yawnick of Life in LoFi for publishing the call twice. Last but not least, we also wanted to thank all the people who have made a donation to eyephoneography and have become our “official supporters”. For those who haven’t done so yet, please consider adding you name to that list too! Without any external funding, a group of people and ourselves are working very hard in order to keep all of our activities free (from calls for submissions to workshops) and to promote mobile photography and mobile photographers. That’s why your help is highly appreciated. An additional way to support eyephoneography and the mobile photographers we exhibit is to purchase a catalog or a limited edition print. As Susan Sontag wrote: “To collect photographs is to collect the world”. Now it’s time for the committee to make their selections. Some of the eyephoneography #3 photos will also be included in the ongoing Mobile eyephoneography exhibit that is likely to continue touring after the final provisional stop in Seville in January 2013. There will also be a catalog accompanying eyephoneography #3. yay!!! posted it in iph100*, on my wall and in IPA. wrote IPA as well to put it on their homepage. Sounds great! tweeted and shared! As far as submissions go, is “digital mobile art” (manipulated with numerous apps) acceptable or is it “as shot” pieces? Hi Joel. It is perfectly OK. We featured Carlein, a master of that style in eyephoneography #2! i would love to participate. one question: you ask for 5 images as a series. if selected you would want 10 images more. can this be different series or even single pictures? the serie i would like to submit contains 5 images and no more. We expect to receive hundreds of submissions. Therefore, the five initial images are meant to grab the attention of the selection committee while conveying a specific vision, a particular way of expressing yourself through photography, and they don’t need to be one single series. Before making their selections, the committee will also look at your portfolio/gallery and your short bio in addition to the initial five images. So, if all you have are the 5 images that you have submitted you´ll probably won´t get selected. Having said so, you are welcome to send your five-image series and – if shortlisted – you´ll have to send 15 additional (not 10) images. Sounds good! How have I not known about this site before?! Found via Life in Lofi tweet and will re-tweet. My images all have my digital signature (c) AlyZen Moonshadow 2011 (or now 2012) on them. They are at the bottom right or left of my images, small and discreet, and they are integral to my work. They are NOT watermarks. I hope that’s acceptable for the open call submissions. Thank you, AlyZen. AlyZen, we gave our advice, but please feel free to send them. Rocio, muchas gracias. I asked about submitting my work with my signature because I am very serious about my iPhoneography and my Vision and it would be a great honour if I was selected for the show based on the merits of my work. I am prepared to re-submit my images without my digital signature, if it means they will be considered by the Selection Committee, and not disqualified simply because they are signed. Please let me know if you would like me to re-submit my images without my signature. Thank you, AlyZen. You don’t need to resubmit, AlyZen. Your images are already included in the gallery that the committee will use for the selection. Good luck! Hello! What an exciting project! I did send my submissions. I fear that some may have been my lower resolution versions. If so should I resubmit my entry? Will I still be considered? Thanks so much. Hi Jennifer. I have checked and yes some of your images do not comply with the guidelines. If you hadn’t noticed they would have been rejected automatically! Please send them again. Ciao. Question: requirements call for “shot and edited on a smartphone.” Does that mean it’s not permissible to upload and develop in Lightroom or Photoshop? another question: with the mention of “Shot and edited on a smartphone”, does this disqualify submissions of pictures taken with mobile phones that simply have the camera feature with basic editing functions (as opposed to branded smartphone mobiles)? thank you! Hi Michelle. Of course not! Any mobile phone is welcome. We couldn’t care less about brands. Keep in mind, though, that we exhibit photos at roughly 40x30cm so a decent amount of raw megapixels (typically found in smartphones) is necessary. Awesome!! i’ll keep that in mind and review the pixels of my favourites! thank you! portfolio? do you mean website? portfolio of more eyephone images? portfolio(s) on website but not necessarily eyephone images? A URL where the committee members can see more of you work if your submission grabs their attention. Having in mind that they are selecting mobile photographers, it’s entirely up to you to decide what you want them to see. Have a question, regarding the submissions.. can I submit images that are run through many iphone apps and are heavily modified art images? Or is it that the images that needs to be submitted are the one’s that are shot and are ‘As Is’? Please let me know… Thanks!! Hi Imran. It is perfectly OK. We featured Carlein, a master of that style, in eyephoneography #2. Correct Elaine. Shot/edited on a smartphone. Ciao! Hola! No acabo de entender si puede incluirse un texto que explique y cuente las pretensiones del proyecto. Hola Fausto. Claro que si. En el formulario aquí arriba hay un campo “Cuéntanos algo sobre ti y tu fotografía (100 palabras max)”. Saludos. I submitted my photos earlier today but have yet to receive a confirmation via email. Was wondering if I should submit again or wait it out. If the entries were rejected for any reason would we be notified? It was difficult to get the files under 500kb and I wasn’t sure if that would be a reason for them to be rejected. Any help is appreciated, thanks. Melissa, we got your submission. Check your spam folder for the email. Thanks. I do not have a website for my work. Jenna, it doesn’t have to be a website. A link to a set on Flickr, for example, would be perfect. Thanks Marco, I can’t seem to find the email so I appreciate the confirmation here. Thanks @Marco for the reply. I have submitted the Images!! Cheers! Just a query… Also will it be communicated to the person if his/her images are selected or disqualified? am I too late to submit my images? I am in West Africa and have been without electricity (internet) for 2 days… did I miss the deadline? is there an extension? We’re sorry Cheryl! The call was open for a month and there will be no extension. Next year remember to submit earlier ;). Cheers. Very exciting! Eyephoneography is the most professionnal team I ever meet! Long life! I take it February 3rd by midnite vancouver time doesn’t count!! ;) aw shucks, next year!! Good luck all! No Michelle, we’re based in Madrid, Spain. Remember next year! Cheers. How did that happen Lene?! There was even a live countdown on our page! 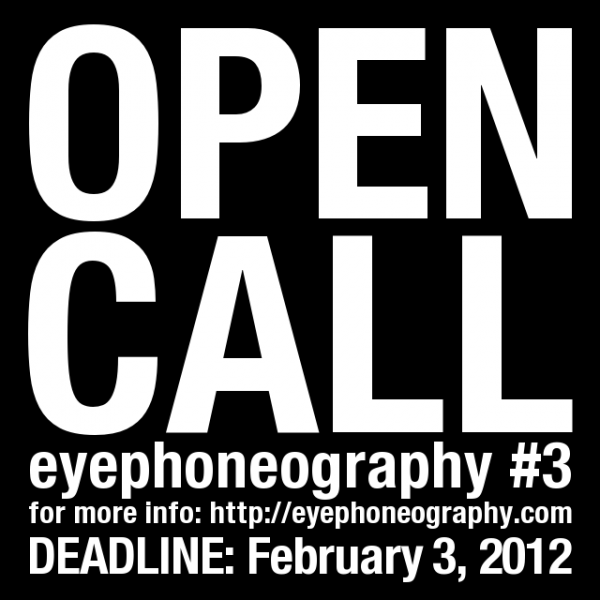 Very exciting, thank you eyephonoeography for the opportunity! The system to rank the submissions in in place and the jury is at work! We gave them 2 weeks to come up with their proposals and we will share the news as soon as the final shortlist is assembled. By checking the rules again, I just noticed the limits on dimensions (min. 800px). The files I uploaded were 612×612, but I have the bigger versions here. Is it possible to send the bigger versions or is my entry not valid anymore? Hi Olivier, unfortunately it is not possible to resubmit the photos at this stage.